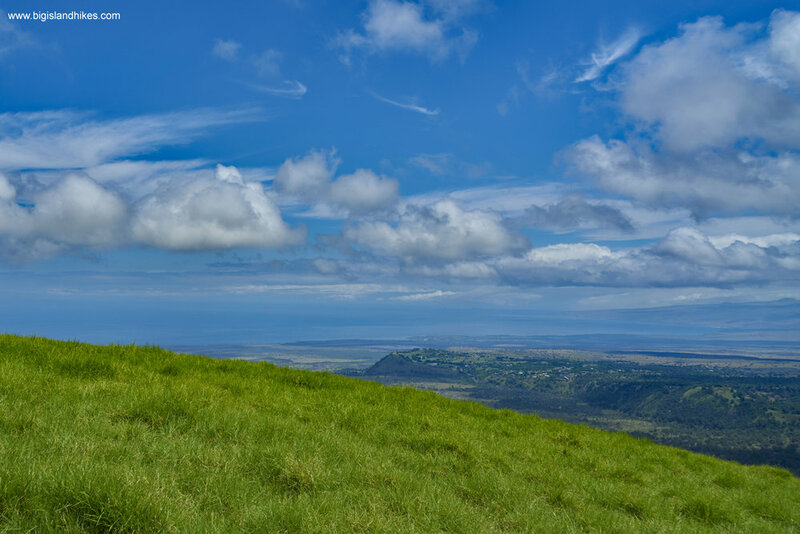 Meaning "many-furrowed hill," this ancient cinder cone has a commanding view of the Kona Coast, Mauna Kea, Mauna Loa, and Hualālai.It is over 100,000 years old and is the oldest land feature on Hualālai. It is known as the "jello mold hill" because itresembles an upside-down mold when viewed from afar due to the erosional furrows on its sides. This area was once private ranches, but is now managed by the Division of Forestry & Wildlife and the Pu‘u Wa‘awa‘a Volunteer Program. Although Pu'u Wa'awa'a is the signature landmark of the area, this region actually has a number of excellent trails. It's possible to do a nice big loop here and experience everything that it has to offer. The view from the top of the Pu'u is staggering. The trails here are almost completely the work of volunteers, and there is no official state maintenance. This preserve contains a wealth of endemic and endangered plants, animals, and insects. Stay on the trail at all times (there is still private land in the area). Pick up any trash you find and try to take it with you. Dogs are not allowed. There are several gates in the area because some of this land is still used for livestock. Close all gates as you pass through them. Trailhead: Traveling from either Kailua-Kona or Waimea town on Hwy. 190, find the turn for the trailhead between the 21 and 22 mile markers (closer to the 21 mile marker). Drive along a white pipe fence and shortly find a metal gate that opens automatically by the presence of your car. Drive up the Vulcanite Road and park near the check-in station. Gear: The trail is steep and rough, so sturdy boots are appropriate. This hike travels to nearly 4000’ above sea level, so it is much cooler than coastal hikes. Bring your raingear - afternoon rain is a near certainty. Hike: This route travels in a large loop around the entire area, but you could break this up into several parts for many different combinations. 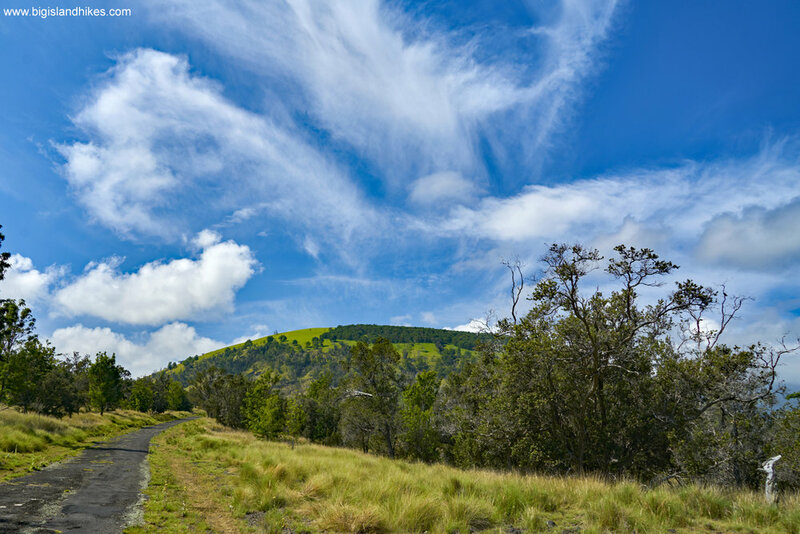 From the trailhead, walk south along the Vulcanite Road for 1.5 miles until you reach the beginning of the Cinder Cone Trail. Find some old ranch implements and pass through a gate into the old ranch. Close the gate behind you -- ranchers still use this land to graze stock. After a short distance, find the Tamaki Corral, a historic old corral from about 100 years ago. Pass the corral and countour around the Pu'u to the southeast and find an old ranching road that climbs steeply up the center of a large draw on the southeast side of the Pu'u. Follow this steep road to a saddle between the east and west summits of the Pu'u. The western side is a bit higher at 3,967 feet. Enjoy the views and return the way you came to the beginning of the Cinder Cone trail. When you reach the Vulcanite Road again, look sharp to the west for Miki's Road (now a trail). This trail passes through some amazing old growth forest. After 0.75 mile, look to the east for the intersection of the 'O'hia Trail. This trail also passes through well-protected old-growth. After 0.6 mile, reach the Vulcanite Road again. Turn north on the Vulcanite Road toward the parking area and trailhead. If you want to continue and hike the Halapepe Trail, walk past the parking area and take this loop hike in either direction back to the trailhead and parking area. Use the links above to trail brochures created by the Pu'u Wa'awa'a Volunteer Program to find out more about the trails here.